Please refer to our stock # 1296 when inquiring. 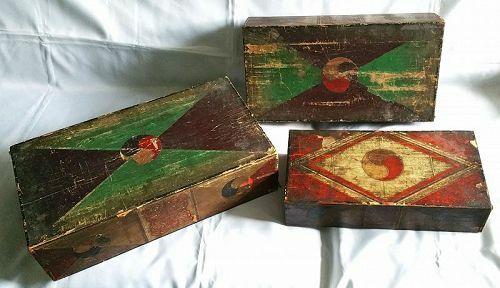 Set of Three Nesting Wood Boxes covered with Applied Hand-Cut Paper Designs and finished with a light oil. This is very much like the one in the Brooklyn Museum (see page 163 of the Korean Art Collection in the Brooklyn Museum, 2006). The Brooklyn box is only one box, whereas this is three nesting boxes. The Korean Taeguk symbol adorns the lids and sides of each box, along with stylized floral designs. With one more section than the two-sectioned yin and yang symbol, the three-sectioned Korean Samtaeguk symbolizes Heaven (red), Earth (green) and Humankind (yellow), which combine and interlock to form the supreme ultimate unity of cosmological forces. Large Box: 18 x 10 x 5 inches, 45.75 x 25.5 x 12.75 cm; Medium Box: 16.25 x 8.5 x 4 inches, 41.25 x 21.5 x 10 cm; Small Box: 14.5 x 7.25 x 3.5 inches, 37 x 18.5 x 9 cm.